Christmas is the only time of year I drink hot chocolate and this year I jazzed it up a bit. Cocoa obsession aside, hot chocolate has always been one of the more boring chocolate things to me (unless it's ciocolatta calda from Italy in which case, I concede). See I'm not a big milk drinker and I like chocolate I can chew. 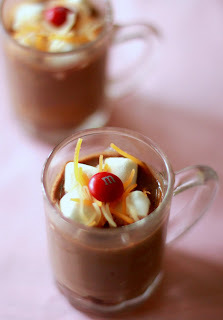 This peanut butter hot chocolate shot is ridiculously rich, thick, and lovably lumpy. You'll get your chocolate fix in one sweet gulp--with a chewy surprise or two. 1. Heat milk in a pot. Melt baking squares and stir in. 2, Add peanut butter and stir until melted (I like mine lumpy so I didn't melt it all the way). Add condensed milk and mix well. 3. Top with marshmallows. I threw in an m&m (just cause) and shredded asiago cheese in there but that's just me! 1, 2, 3, bottoms up.